USPC would like to highlight the National Youth Board Members for the current term. Today we would like to introduce Brittany Flores. Brittany is a member of Woodside Pony Club in California and is a C-1 HM and D-3 HSE. Brittany has been riding since she was 5 years old and focuses on Hunters/Equitation and also enjoys trail riding the horses she has at home. 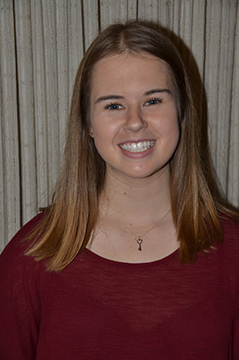 She is a freshman at Saint Mary’s College of California and is majoring in Communications. After her undergraduate degree she plans to go on to business school. Brittany has been a member of Woodside Pony Club for almost 11 years. As part of a school project during 2017 she started a donation process to help the Compton Junior Posse. This non-profit organization located in the Compton area of Los Angeles, California, takes kids who have been associated with gangs or want to stay out of gangs and teaches them how to ride horses and teaches them responsibility for taking care of their horses. Brittany raised over $1000.00 in cash and provided an entire truckload of boots and tack to help this wonderful program. In 2016 she also was awarded the Sandy Hall Award by Woodside Pony Club to recognize her for her ongoing contribution to mentoring others in local clubs. She assisted the Glen Oaks Riding Center for several years by teaching horse management and led them on their first ever un-mounted rally. Throughout high school Brittany also played on the golf team and in 2015 she was awarded the Coaches Award at the end of the season. In her free time, Brittany enjoys hiking, swimming, and traveling. Pony Club has always been an important part of her life and she plans to continue her involvement during college and afterwards.